After a Long day, everyone deserves a good sleep. 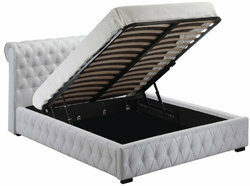 For the connoisseurs of comfort, we are offering dreamy beds with necessary accessories such as the side units. Be it wooden or upholstered, everything is the result of quality art work with the added 'wow' factory. Being a leading firm in this industry, we are deeply engaged in offering a high-quality range of furniture.